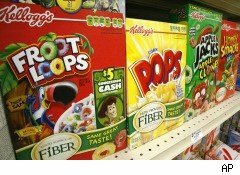 Froot Loops, Apple Jacks, Honey Smacks and Corn Pops cereals are among the 28 million boxes being recalled by Kellogg due to a "waxy" smell coming from the package liners. The company is voluntarily recalling the cereals, saying the smell could make people sick. While the company says the potential for serious health problems is very low, about 20 people have complained about the cereals' smell throughout the United States, including five who, company spokeswoman J. Adaire Putnam told us, reacted with "temporary symptoms of vomiting, nausea, or diarrhea, and reported that they recovered quickly." The problem, says Kellogg, is some substance in the liner of its packages; a product manufactured by a third party (the company wouldn't say who). The company first noticed a pattern of customer complaints on Wednesday, and issued the recall Friday morning. While none of the customers who have complained have been outside the U.S., Kellogg is completing its trace of the products' distribution; it is confirmed that none of the odorous packaging is in Canada, but it's possible some may have been distributed to other countries. The company's press release indicates that consumers should not be concerned of serious health problems from eating the cereal, if they have already consumed some of the boxes included in the recall (see below for UPC symbols and sizes of recalled packages). However, "some consumers are sensitive to the uncharacteristic off-flavor and smell" and are urged to avoid eating them "because of possible temporary symptoms, including nausea and diarrhea." The odor was also described as "stale, metal or soap-like" by the company spokeswoman. Kellogg has not issued a food-related recall since some of its products were included in the enormous Peanut Corporation of America salmonella outbreak in January 2009; however, this is only the latest in a string of recalls this week by other companies, including Scope mouthwash and Vasospray nasal decongestant. Customers may call Kellogg Consumer Response Center at 888-801-4163 from 8 a.m. to 8 p.m. eastern time for a replacement; while the press release does not mention a refund, it is probable that consumers who ask specifically would be given one. Below is a list of the products being recalled.